Experience the 2003 season of the FIA GT Championship first-hand on your PC as you test your skills against over 50 opponents on all the legendary race tracks the FIA GT visited that year. 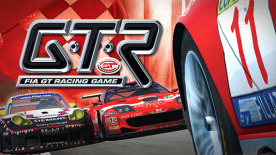 Developed by racing professionals, GTR is a true milestone when it comes to racing games. GTR FIA GT Racing Game @ SIMBIN STUDIOS AB. The FIA GT is licensed from SRO. All rights reserved. All other trademarks are property of their respective owners.